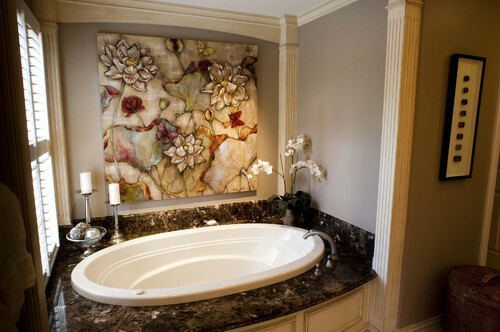 I love the look of using marble slab on a tub deck/ surround. First of all, it's a great way to show off a beautiful piece of marble. It's also better for maintenance, if you hate grout lines as much as I do. 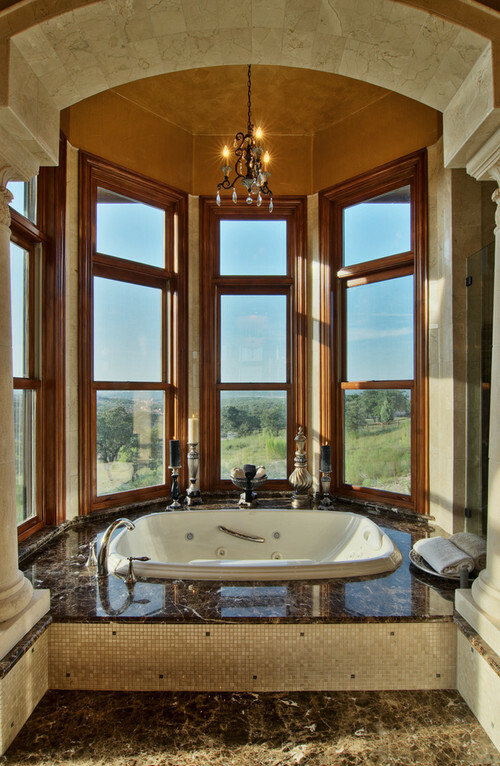 Here are 8 Tub Decks made from marble, travertine & granite slabs. I love the design in this first picture. 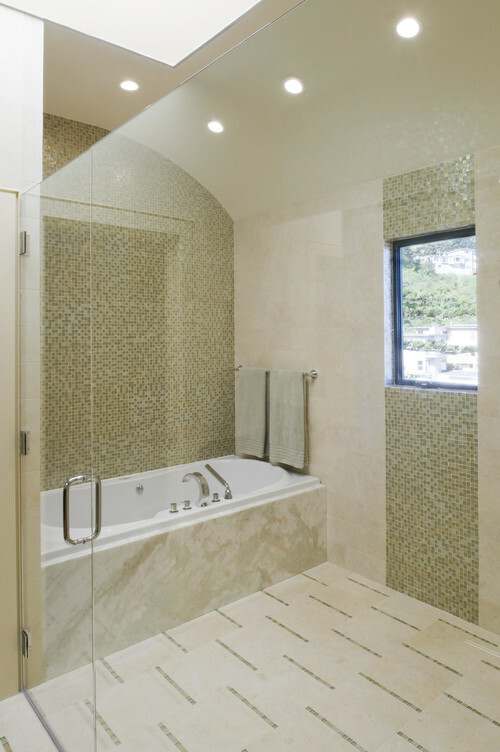 The radius tub deck is really beautiful, but my favorite part is the backsplash. I like how they popped a piece of the slab out for the faucet. The detail in the design of the backsplash is really pretty as well. 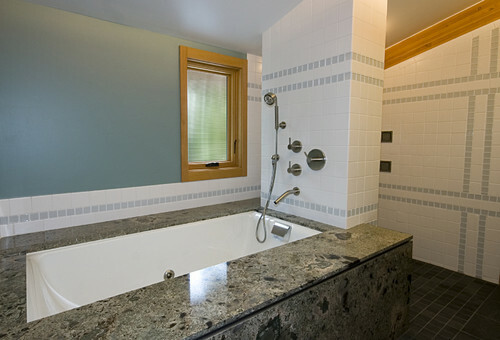 Seafoam Green granite slab on the tub deck and the face. This next photo isn't a tub deck. 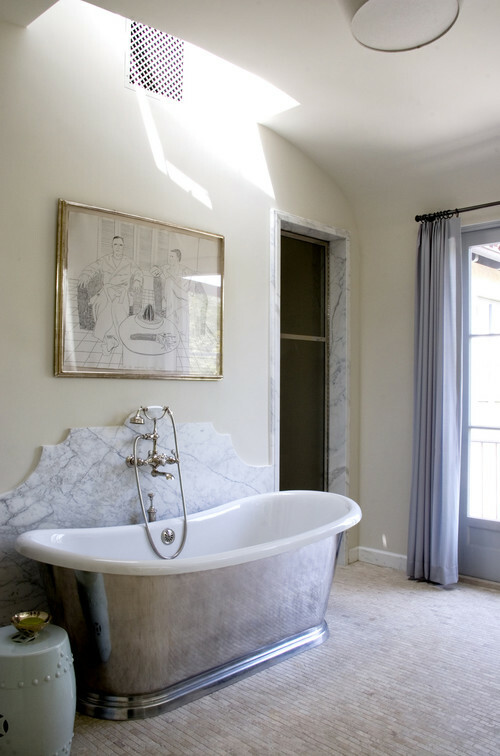 They used the Carrara marble slab in a really interesting way by putting it on the wall as a backsplash. Some bathtubs don't really have room for slab on the deck, we can put slab on the face though like they have done in this next photo. Even the white marble steps are slab in the photo below. Emperador Dark marble on the deck and backsplash. 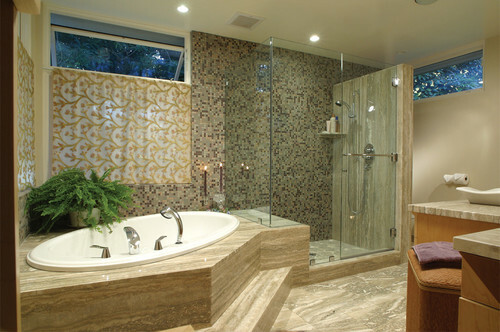 Beautiful linear travertine, they used slab in the shower as well. The flooring is the same travertine but in tile. Another Emperador Dark marble tub surround and steps. What do you prefer? Tile or slab on a tub deck? I prefer Slab! That's the way we wanted to go when we did our Master Bath Remodel; however, when we discovered the tile was set around the tub (which we were reusing) in solid concrete, we reconsidered...leaving the tile and using grout paint to color the grout lines the same as the tile. But I LOVE the solid slabs. Gorgeous!